Poland's President Andrzej Duda tells a news conference he has decided to sign two laws that will put courts under more political control even though they are part of a review a concerned European Union is conducting in Warsaw, Poland, Dec. 20, 2017. Poland's populist government remained defiant Thursday in the face of a European Commission decision to trigger a legal procedure that could lead to Poland losing EU voting rights. The unprecedented move by the commission to invoke an article 7 process to deter the Polish government from tightening political control over the judiciary was met with bravado by the country's president, Andrzej Duda, who in a television address said he would go ahead and sign two controversial reform laws, adding to 11 other measures. Duda was careful in his late Wednesday address, though, not to repeat some of the more fiery responses from Warsaw that have characterized the two-year-long confrontation between Warsaw and Brussels over the changes made by the country's ruling Law and Justice party (PiS). "We're bringing in very good solutions in Poland that will serve to improve the justice system,"he said. Poland's prime minister, Mateusz Morawiecki, also was careful with his wording in defending the actions of his government. On Twitter he wrote, "Poland is as devoted to the rule of law as the rest of the EU. "But he added,"Judiciary reform is deeply needed." The signing of the measures, which critics say effectively places the Polish courts in the grip of the governing party, now sets the stage for a deepening crisis in the heart of Europe and threatens to divide the EU, east from west. The European Commission says the two laws undermine the legal standards expected of member countries and amount to a"serious breach" of the rule of law. Other critics bemoan what they say is a turning of the clock back to the authoritarianism that Poland endured under Communism. As the commission announced it was triggering an article 7 process, Poland's Justice minister, Zbigniew Ziobro, continued to purge senior judges, dismissing some by fax. "We have to continue with the reforms of the justice system,"he told reporters. Article 7 was added to the EU's founding treaty in 1999, allowing for sanctions to be imposed on a member country for breaching democratic rights. The article has never been invoked before, although the commission has threatened several times to use it in the past. European Commission Vice-President Frans Timmermans speaks during a media conference at EU headquarters in Brussels on Dec. 20, 2017. In announcing the EU decision, Frans Timmermans, the commission's first vice-president, said it was doing so"with a heavy heart"due to the adoption of several measures since the PiS came into power,"which put at serious risk [the] independence of the judiciary and the separation of powers in Poland." Brussels rejects the Polish government's claim it is modernizing the judiciary and the courts. 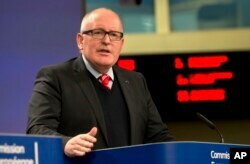 Timmermans said Wednesday the reforms should be in accordance with Poland's constitution and EU law. "If the application of the rule of law is left completely to individual member states, then the whole of the EU will suffer," he said. EU officials say that membership of the bloc requires states to observe the legal standards and norms agreed by all. Analyst Bruce Wilson said, "Over the last two years there have been a number of legislative actions by the current ruling party which limit the independence of the judiciary, and the view of the European Union is that part of the process of building a democratic society is that the three arms of government, the executive, the judiciary and the parliament are independent." Wilson, professor at RMIT University's European Center in Australia, said "in the last two years, 13 pieces of legislation, according to the EU, have threatened the independence of the judiciary." He said Brussels fears the PiS is"limiting the capacity of the judiciary to review the actions of the government." PiS leaders have couched their fight with Brussels as a David versus Goliath tussle with cosmopolitan overlords, accusing them of undermining patriotic values and the cohesion of the country. The Polish government also has taken issue with Brussels for trying to force EU member states to admit Muslim war refugees and economic migrants. The position is supported by other central European states, including Hungary, which disapproves of Wednesday's triggering of article 7. Zsolt Semjen, Hungary's deputy prime minister, condemned the commission's move as astounding and unjust." He added in a statement,"It is unacceptable that Brussels is putting pressure on sovereign member states and arbitrarily punishing democratically elected governments." How the standoff between Brussels and Warsaw now plays out is unclear. The two laws President Duda signed defiantly would force two-fifths of the country's supreme court justices to retire and give parliament control over their replacements. Poland has also fallen afoul of the EU commission — and attracted criticism at home and overseas for illiberalism — for changes to laws governing the media and human rights. In October, Human Rights Watch accused the PiS government of eroding the checks and balances necessary for democratic government. "Since its election win in October 2015, Poland's ruling party, the right-wing Law and Justice Party [PiS], has used its majority in the Sejm [the Polish parliament] to seek to introduce laws and policies that have serious, negative implications for human rights and the rule of law," HRW said in its report. The rights group accused the government of interfering with the independence of the judiciary and the administration of justice; undermining freedom of expression; limiting the rights of protesters; restricting women's reproductive rights; and violating the rights of migrants and asylum-seekers. The claims were dismissed by the Polish government. PiS has the support of half of the country, according to opinion polls, and the opposition to the government is divided and in disarray. But Poles are highly enthusiastic about EU membership, according to surveys, and analysts say there are political risks for the government if the confrontation worsens.